Nostalgia! I read this when I was about eight, and ever since then the idea of a yellow bedroom has just struck me as so delightfully cozy and sunny and welcoming. (I then forgot the title, and it took me more than fifteen years to find it again...) It's somewhat outdated -- I wonder now why my teacher had a copy -- but very sweet. Read this years ago. Don't remember that much of it, and I think I didn't even finish it, but it did inspire me to ask to have my room painted yellow.UPDATE: Read it again in June 2014. Enjoyable, but the four-star rating is for what I thought of it as a child. Reading it as an adult, I sure wish I lived in that la-la land where a kid can move to a new town and have no trouble at all adjusting; all your kid friends envy you -- but only in an admiring way -- for living in a big house with your own room and a private bath; a nine-year-old child is consulted about whether or not her family will move, and whether they will take in boarders; and in springtime the yard is carpeted with all kinds of flowers, but not a single dandelion. It's like the movie Pleasantville or something. Also: Why the hell did they buy a huge new house that needed a ton of work before the dad's promotion even happened? Also it was appalling that they didn't prep the walls before painting her room. Now I know why I've always wanted a yellow room! Found a whole bunch of YA books from the 1950s-'60s at Goodwill, and decided to check them out. This one was first published in 1956. Interesting to get a glimpse into the period. I kept trying to figure out how old the main character was, because at times she seems like a teen, but then she she seems rather young. She's in fourth grade, so I suppose she's about nine or ten. I think I would have liked this as a child. It was a pretty well written book. But I also found surprised by the actions of the parents. The premise is that in anticipation of a promotion, the family moves out of an apartment in the city to a huge house in a suburban town. The house needs some work, and they put themselves in financial strain buying the house and starting to furnish it before the father gets the promotion. The kids want their rooms painted as soon as possible, so the father spends his weekends and nights after work painting walls. Poor guy. The children are reasonably well behaved, but the parents never scold them. I also couldn't quite figure out the school day. It seemed to end at lunchtime, but I suppose the kids may have just gone home for lunch.The only bad person is a girl at school who seems to want to be friends with girls she thinks are rich. Cathy judges her for this, by Cathy also brags about her room, her fathers' job, etc. so it seems a bit hypocritical. Cathy does seem to learn some lessons and gain maturity through the events of the novel, though. Not sure how a modern juvenile reader would feel about this, but I found it entertaining enough for what it was. I do not like Cathy. She's a little b+tch until she meets Naomi, who is kind and gentle and thoughtful. Luckily, some of that rubs off on Cathy by the end of the book. I don't remember reading this as a child, but I could swear I read something by Catherine Woolley.There were a couple things I found noteworthy:1. On page 50, "I would like yellow paint, Cathy thought dreamily, gazing around, so it will always look as if the sun were shining." One of Cathy's more positive moments.2. Cathy is all dolled up in her dress and goes sled-riding with her new friends. There is no mention of her changing into a snow suit or even her dungarees, for that matter. Everyone knows you don't sled-ride in a dress.3. In Chapter 5 Cathy's whole existence almost comes crashing down when Daddy says they might have to move to, horror of all horrors, PITTSBURGH because of his job. Whew! Luckily, Daddy's company decides their headquarters will be in New York and not the 'Burgh and the Leonards get to stay in their new house. I remember reading this book as a child, and being completely enamored with all the descriptions. Something about painting her new room yellow made me feel happy during a time when I was experiencing the exact opposite. It's stuck in my mind all these years and I'm glad I was able to track down the name of it. Such a lovely story for a young child. I'll give it the rating I would have given it back then.... 5 stars. It taught me to dream of better things and the hope of a happy home. This was my favorite book when I was about 11 years old. I shared a room with my two younger sisters, and could really understand Cathy's desire to have her own room, and how excited she was about it. I still have it to this day, though it is locked up in a storage unit in NJ! This was an reassuring book for me as a child because one of my personal goals was to get my own bedroom. Meeting someone in these pages who felt the same gave me comfort. 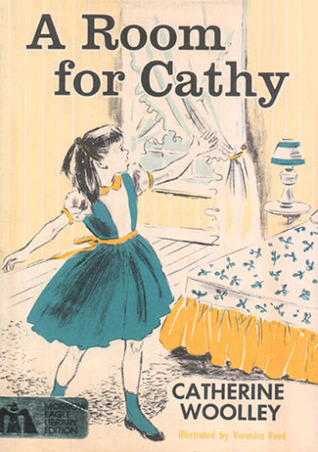 I also saw Cathy as being less fortunate than me in some ways, so the story probably helped me learn empathy. I identified strongly with Cathy as I was sharing a room with a messy, noisy little sister. I think I read this book at least five times just to reassure myself that I wasn't alone in wanting some peace and quiet. Well A Room For Cathy was a super good book. I liked it because Cathy wanted her own room and then they moved and got her own room then they might have to move to someplace in PA . And the house might have to be rented and now I really would like to read another good book like that. I loved this book when I was 11 or so. I wanted a room of my own so badly. Finally my parents caved and I moved into my cold but single room when I was 12. Had to bunk again with my sister each winter, but bliss when it was warm enough to move back each spring. Read this years and years ago and liked it a lot. Now I have read it again with my granddaughter and we enjoyed it together. It is a bit dated, but the lesson of sharing and caring will never be too old to learn. i was really amazed how selfish cathy was being but in the end she gave her heart to other people. This was one of my mother's favorites and my grandmother kept her copy at her house when I was little. I must have read it a dozen times. I loved knowing it was my mother's favorite. My favorite book in elementary school. i don't even need to write a review for this book, it's just beyond adorable and fun easy read. Re-read for about the millionth time. Each time is enjoyable. I had to search long and hard to find this book for Lily on Amazon for her bday. I had it and loved it as a girl. I reread it and it was just as wonderful as I remembered. Catherine Woolley - A prolific writer of over eighty books, Catherine Woolley published so many children's books that her publisher recommended using a pen name for some of her works. Ms. Woolley's Ginnie Fellows series was and continues to be a reader favorite across generations.Pen name: Jane Thayer.